Please enjoy and read aloud the iBook version. Four Versions for individual, group and Readers Theater. Watch the trailer and download the movie here. Click on the book cover to purchase from iBooks. "SANTA AND SONS & daughter!" movie marking 6th Anniversary Public Access TV Event showing. 2010 was its sixth anniversary year, "SANTA AND SONS & daughter!" the family musical movie is showing on Public Access TV throughout December in 33 states  over 200 cities in the U.S. and internationally. "Along with recent additions Duluth, MN; Amherst and Worcester, MA," adds Producer/Director, Robert Battaile, "the movie shows in cities large and small, even Vienna, Austria"
The goal was to raise awareness in the local community and the media about the good things local P-E-G (Public, Education and Government) channels are doing for the community. Many are thankless tasks, like covering City Council and Planning Commission meetings. Most are done with volunteers that learn video production and communication skills in the process. If you don't have a relationship with your local Public Access station, this is a good chance to find out how they're doing. And, to make sure they are going to survive. I like to think families can sit down with our movie and think about how it was influenced by Community Television. This is a low budget indie film. For audiences, it is closer to people's possibilities than trying to make a $60 million Hollywood spectacular. We want to promote do-able Performing Arts, Writing and TV production at the same time. We hope conversations get started. I got my start in video production from Austin Community Television thanks to being able to borrow the black-and-white 1/2" videotape recorder and separate camera. "Broadcasting" was a drive up the mountain to a shack at the base of the tower. Three years later, we're showing our indie film across the planet from Vienna, Austria (okto.tv) on Christmas Day at 8:00 pm to a dozen times in Yakima, Washington (YCTV). We've added Amherst and Worcester, MA and Duluth, MN recently to our 300+ "alumni" cities. One station that is streaming the movie live is Miami Valley Communications Council (mvcc.net) in Ohio. Like many stations, they reach many cities including Centerville, Germantown, Kettering, Miamisburg, Moraine, Oakwood, Springboro and West Carrollton. But, that gives you a chance to go to your local Public Access TV website and find out what's going on. It's a good thing to do, thanks. Watch a :60 trailer at http://www.youtube.com/watch?v=GBDEuextKFU and click on "high quality" for best viewing. Patience please. Please visit www.saveaccess.org and www.ourchannels.org for more information. All of us need to convince our government representatives to make sure Public Access stations are adequately and permanently funded. "SANTA AND SONS & daughter!" is an indie musical movie that was produced by Battaile's video company CALEXAS (www.calexas.com) in northern California in 2004, and appeared in three festivals, Gloria Film Festival, KidsFirst! Film and Video Festival (where it was also nominated for "Best Movie for 8-12 Years Olds") and STARZ! Festival. Creative Child Magazine gave the film an Award. "SANTA AND SONS & daughter!" 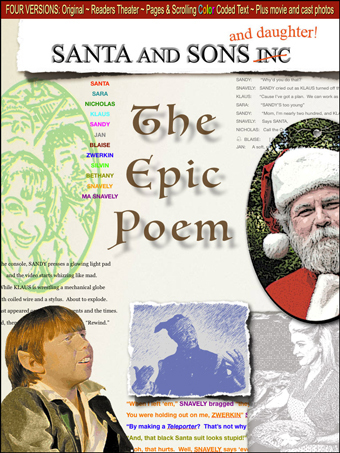 introduces Santa's wife Sara, two sons Nicholas and Klaus, and daughter, Sandy Claus. Sandy flies a talking, anti-gravity sleigh named Blaise and falls in love with Zwerkin, the inventor of a teleportation device that helps Santa get into houses without chimneys. The villain, Snavely puts on his black Santa-suit and sings about "deer kabobs and antler soup." The comedy musical features seven songs. Snavely is played with distinction by R.J. Snead, a singer and actor living in the North Bay. "I hired R.J. after we sang a couple of my original songs together in a production of "Planet Vega$" which ran in Napa and Calistoga. He's performed in numerous plays, commercials and gospel choirs. He's a practicing minister. "I knew he could nail the theme song "Snavely Claws." Battaile continues, "it wasn't about color  way back when, our first cast had a white guy playing Snavely; but R.J. took the character to a whole new realm." Please listen at www.calexas.com/media/snavely-claws.mp3. The movie was originally written with Mark Reinking some twenty-five years ago in Austin, TX. Battaile named some of the characters after his young kids. "When we finally made the movie, the kids were grown and worked on the show." Silvin was the Director of Photography and Bethany designed the anti-gravity sleigh named after her sister, Blaise. CAST and CREW update: Almost everyone is still in Northern California. Robert Ayres (Santa) continues to use that amazing voice for commercials and video games; along with occasional stage and indie movie performances (www.robertayresvo.com). Linda Fischer (Mrs. Sara Claus) is heading off to a Kona, Hawaii resort for a clothing catalog modeling gig. Life is tough. She's also been doing runway and commercials. Kimberly Jensen (daughter, Sandy Claus) is managing the family print business, Ram Print and Communications in Mill Valley with occasional appearances in the popular review "Beach Blanket Babylon" (as Snow White) and other plays. Listen to Kimberlina's Christmas cd at www.kimberlyjensen.org. Michael Waterson (eldest son Nicholas) is the Managing Editor of the American Canyon Eagle Newspaper and also a member of the Irish singing group, Kithe and Kin which performs throughout northern California. He's also appeared in his one-man play about Edgar Allen Poe. Christopher Spitzer (Chris Todd) who played Santa's son, Klaus Claus has been performing in "Inherit the Wind" and "Biloxi Blues" on stage in New York. He's still a producer for ABC News, and was working at Obama's Headquarters on election night. Kiernan Morgan, who played Santa's main elf JAN is a Champion Irish Dancer with the McBride School of Irish Dance in Dublin. Now 17, he's been performing since the age of 8 in the Vallejo Music Theatre. John Maniaci, who played single Dad and inventor, Zwerkin (also Sandy's love interest) is back in Sacramento after playing a doctor with Cybill Shepard in "Listen to Your Heart" which filmed in New York. He's been in commercials and industrials as well. Holly Stell, the child prodigy that plays the mysterious operatic elf Didl that sings the "Close Your Eyes" lullaby continues to amaze audiences on record, and in live performances. Now 15, she also has her own Christmas Album at www.hollystell.com . Annabelle Marie (Cruz), the leader of our elves and Director of the VOENA Choir, was honored with the prestigious Jefferson Award for Outstanding Public Service. The inspirational children's vocal group were Santa's elves. Check www.voena.org for more about these young musical ambassadors. Robert Battaile, Director/Producer has been finally making that "Robert B+" audio-cd. www.calexas.com/robert-cd Soon, editing starts on "America Needs Talent!" an original play shot in Calistoga. ln 2009, he started the Santa Rosa Bocce League with its documentary next to be edited. and mayhem consulting business at www.freeflightcreative.com. Tony Grisey, who helped animate the Sleigh works in enviromental projection at Obscura Digital.